BEIJING (AP) — Chinese tech giant ZTE Corp.'s chairman promised no further compliance violations and apologized to customers in a letter Friday for disruptions caused by its violation of U.S. export controls, a newspaper reported. Washington's agreement Thursday to restore ZTE's access to U.S. components removed a prominent irritant in relations with Beijing, but the two nations still are embroiled in a broader conflict over trade, tariffs and technology policy. Chairman Yin Yimin's letter also apologized to ZTE's 80,000 employees, according to the South China Morning Post. Their jobs were in jeopardy after ZTE lost access to U.S. technology and suspended most of its operations. Yin's letter said there were "problems in our compliance culture" and ZTE should "hold the relevant people accountable and avoid similar issues in future," according to the Post. "I would like to apologize to all employees, customers, shareholders and partners." 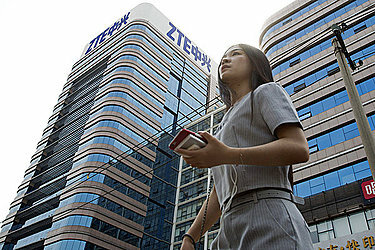 ZTE, headquartered in the southern city of Shenzhen, declined to comment on the report. An employee who asked not to be identified further confirmed Yin sent a letter to the workforce but would not confirm its contents. The conflict added to strains over President Donald Trump's threat to hike tariffs on up to $50 billion of Chinese goods in response to complaints Beijing steals or pressures foreign companies to hand over technology. Chinese anti-monopoly regulators have withheld approval of Qualcomm Inc.'s proposed acquisition of NXP Semiconductors, which some commentators say is being used as leverage against Washington. "The settlement on ZTE does not significantly impact the probability that the U.S. will impose tariffs on China," said Eurasia Group analysts in a report. The state-owned company's Communist Party secretary, the chief technology and chief compliance officers and the executive who oversaw corporate operations have been replaced this year. Yin's letter said the issue will not be fully resolved until the U.S. government approves the agreement and unspecified conditions are met, according to the Post. ZTE must "always adhere to the bottom line of compliance," the letter was quoted as saying. "I hope that we can devote ourselves to hard work and innovation and get the company back into business as soon as possible."